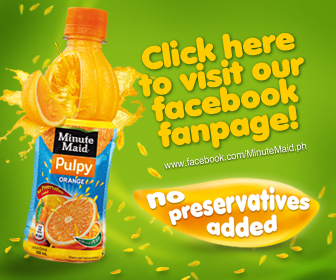 I just drank a bottle of Minute Maid Pulpy. They say it’s got ‘no preservatives added’. Aw, c’mon…It’s bottled juice. Is that even possible? So I thought maybe... a fresh Mango Orange were squeezed into the bottle because I swear I could taste its pulpy goodness!!! Oh so yummy! I didn’t believe it the first time I heard it’s got no preservatives added. So I read the ingredients (even the fine print) and everything checked out! It really has NO PRESERVATIVES ADDED! That means it doesn’t have ingredients that may turn out to be allergens, or worse...carcinogens! Whew! Now that’s healthy goodness that tastes so good, I... make sure I have my daily dose of Minute Maid wherever I am be it in China, Malaysia, Singapore, Indonesia, Thailand , Brunei or traveling around the Philippines. So okay, it’s got no preservatives added. That’s really good, right? Not just because it doesn’t have those icky, harmful ingredients, but it also means... it is freshly squeezed and has the healthy goodness of fruits that makes one lives healthier and longer! So far anyone who still has a hard time believing that Minute Maid has got no preservatives added - meaning it's THAT natural, it's almost like it's plucked straight from the tree, it's just as Mother Nature wanted your orange juice to be, it's got nothing but the good stuff yes, none of those potentially toxic stuff that can harm your brain, kidneys, heart; cause tumors aargh- the list of preservatives' bad effects just go on!!! Anyway, just to prove a point on just how good Minute Maid Pulpy is 'cause it's got NO PRESERVATIVES ADDED, I'm gonna drink my 3rd liter of Minute Maid Pulpy Mango Orange for the day! It is simply delicious! I am so addicted to its refreshing pulpy goodness taste, that when I was in Bangkok, Thailand last week, the Thai attendant @ the supermarket gave me a Minute Maid the moment he saw me:-) not that he saw a signage on my forehead but because, he overheard me looking for a Minute Maid. What are you waiting for? Go grab your Minute Maid fix! Be healthy be merry, drink a Minute Maid today!